The integrated startup manager allows you to dictate what can and can’t run when you turn on your computer. It supports Run, RunOnce and Sheduled Tasks files and registry keys. Removing startup items is a useful way of improving the speed of your computer. 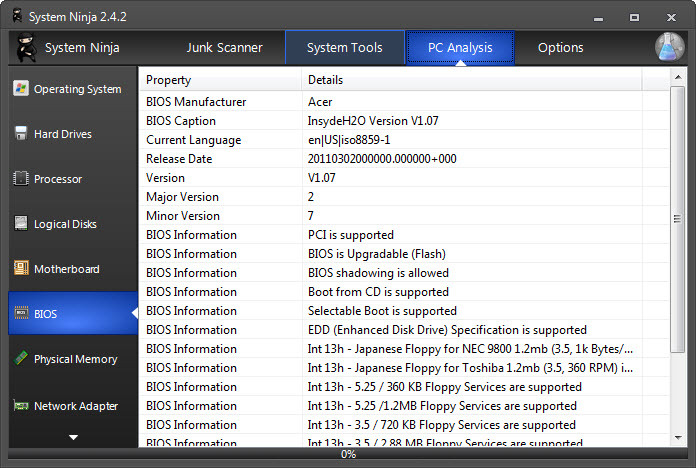 System Ninja is available in several languages, including Dutch, English, Portuguese, Spanish and French. If you want to help out by contributing a translation, please email me. More information is shown by the new Process Manager interface. RAM Consumption, Program Name and ProcessID are shown. The powerful process termination feature remains unchanged. This will allow me (and potentially other people) to add new cleaning rules and paths to System Ninja, without requiring them to be hard-coded into the program. “NinjaScript” (as I’m calling it) will also serve a number of under-the-hood purposes to make everything a bit simpler. If you would like to create your own System Ninja cleaning rules in NinjaScript, check out the documentation.